At StopSignsAndMore.com, despite the fact that we sell a lot of serious, no-messing-around MUTCD-compliant road signs, we are not without a sense of humor. In addition to these official traffic signs, we sell a variety of fun novelty signs that make for excellent gifts. 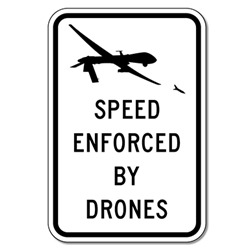 One type of the popular novelty street signs is the “Speed Enforced By Drones” sign that made the news earlier this year by a California local prankster. He got the idea for the controversial sign after seeing real “Speed Enforced By Aircraft” signs along the road in California. His “Speed Enforced By Drones” sign made headlines and got people talking about concerns over privacy. Are police forces going to be shooting at speeding vehicles using automated drones? Probably not anytime soon. But people’s concern over the role of automated technology and government monitoring were made clear due to these creative, make-you-think highway signs. Though the California Highway Patrol has since removed them, they exist now as novelty road signs for those who are more concerned about law enforcement surveillance. These novelty street signs would make the perfect gift for the conspiracy theorist you know. On a lighter note, StopSignsAndMore.com also sells fun gift signs such as unicorn crossing signs. People who delve into the world of magic and fantasy love these signs. They make for fun indoor signs for a bedroom door and also for outdoor novelty road signs. Just like our “real” outdoor signs, these novelty signs for sale are made of high quality aluminum so that they look and feel legitimate. They are available in 12 by 12-inch or 18 by 18-inch diamond shapes. You can customize the colors of these signs or use the yellow background with black lettering for the most genuine appearance. Part of what makes these signs look and feel authentic is that they use the same 3M reflective sheeting materials that standard road signs use. So while you might not think of StopSignsAndMore.com when you think of gift giving, take a look at our gift and novelty signs for sale. You never know what you might find.